After teaching time for many years, I came up with a new idea to make time "manageable" in the lower grades. I start the lesson by explaining about bus stops. I ask the children if the bus stops at EVERY house. They tell me no. " Well, where does it stop?" I ask. They tell me it stops at corners and kids walk to that corner. I ask them if they have ever seen the big bar that swings out from the front of the bus. They tell me yes and we discuss what the big bar does. (It stops cars so that kids can cross the street). Then I explain that the minute hand is like that big bar. It reaches all the way to the edge of the clock to touch the bus stops AND the kids. They giggle, and we go on. Visual learners need comparisons. They have trouble differentiating between the short hand and the long hand, and how they are used. Do you see in the clipart above how it might be hard for kids to tell the difference between the length of the clock's hands? I explain that the four "bus stops" on the clock are like real bus stops. They make it quicker to get around the clock. I then label the stops :00 :15 :30 :45. I actually climb up and put the labels on the wall by the clock. This is all done on day one. 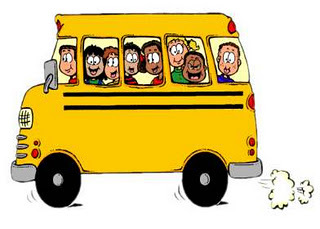 On day two, the class is allowed to shout (quietly) everytime the bus arm (longer hand) reaches a bus stop. They LOVE doing this. They get used to time in quarter segments. From then on, I use the clock for time management. I might say, "Look at the schedule. We have two bus stops until P.E. What bus stop would that be?" or "You have until the next bus stop to complete this task." I do not introduce the hour hand yet. I wait months until they have been accustomed to this idea. I might tell them the correct time, but I do not ask them the time. In first grade, after much practice, I will give them a time like 3:50. I will ask them which bus stop is closer? Can they count on from that bus stop to tell me the time? This concept really works well for visual learners, but is still fun for all.